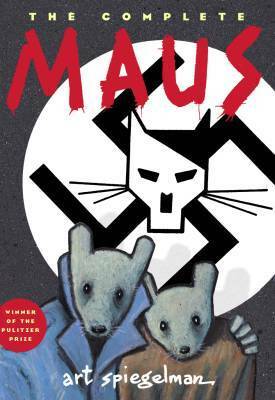 Maus tells the story of Vladek, a Holocaust survivor living in New York. His son Art (also the author), interviews his father about his time spent dodging capture as well as his imprisonment at Auschwitz. Vladek recounts those who helped him, who betrayed him and the Nazis who murdered his friends and family. When not revisiting the past, Art explores his own current relationship with his father as well as his Dad’s obsession with money that both frustrates and ultimately alienates his second wife Mala. I really struggled with what to say about this one. It’s often difficult to even imagine that this really happened. How could a group of people be so ruthless and disgusting? I certainly do not want to come across as being able to identify with the smallest shred of what Vladek went through – no one born in the Western world within my generation could come close to experiencing that nightmare. We’re taught in school about the atrocities committed against the Jewish population during World War II, we’ve watched movies like Schindler’s List, The Boy in the Striped Pajamas, The Sound of Music or even Inglorious Basterds and while they’re powerful films in their own right, they could never truly convey the horror those people went through. There are parts in Art Spiegelman’s Maus that shook me to my core, parts that both disturbed me and left me feeling nauseous. The Jewish population had been a sub-human class to the Nazis and were treated as such. Vladek’s descriptions of the ovens, the gas chambers and at one point, urinating on deceased men, women and children were horrifying. The artwork itself is nothing particularly spectacular but in all honesty, it doesn’t need to be. Other readers have speculated that Spiegelman used a minimalist technique so as not to distract from the importance of the story itself. While there are a few pretty shocking drawings, the majority of the visuals are closer shots and are heavy on the dialogue. Seems a lot of people criticized Spiegelman after its initial release due the assignment of certain citizens to a respective animal (i.e. Germans were cats, Jewish people were mice, Poles were pigs, Americans were dogs, the French were frogs, etc). It may be just my opinion but if you’re honestly offended by the character portrayals, I don’t think you’re paying attention to what the author is trying to give to his audience. If a group of Canadian beavers or moose showed up, I wouldn’t ask for my money back. June 18, 2013 in Art Spiegelman, Comics, Memoir, Non-Fiction.